This is the story about a girl who got the seven seishi of Suzaku. She obtained omnipotent power and made every wish come true. The story itself is an incantation. Whomever finishes reading it, will receive this power. As soon as the page is turned, the story will become the truth and begin. 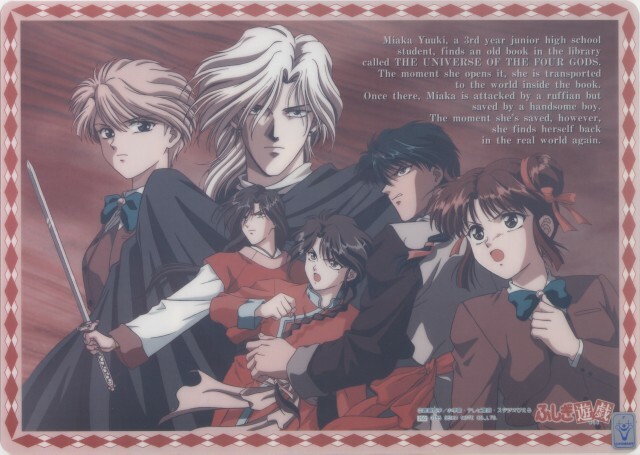 Fushigi Yuugi is about a 15 year old Junior High School student Miaka Yuuki who finds an old book in a library. The moment she opens it she and her friend Yui are transported to a different world, that resembles ancient China. There she and Yui are attacked by Slave traders, but she is saved by a handesome boy Tamahome. Who has a red symbol upon his forehead. She discovers that within the world she is a priestess with the power to summon one of the worlds four gods Suzaku. Once summoned Suzaku will grant Miaka all her wishes. All Miaka has to do is find seven holy warriors or Seishi. Each of whom have a red symbol somewhere on their bodies. Once all seven are found Suzaku will come and grant Miaka her wishes. Fushigi Yuugi is in my unbiased opinion brilliant. The story is very slow and the characterisations are excellent. It begins as a romantic comedy but by the later episodes it becomes a gripping drama, full of adventure, comedy, tears, heroism, betrayal, romance and action. The fight sequences are my only complaint, there just isn't enough of them and they dont go for long enough. It is masterfully written and author Watase Yuu never ceases to impress me with the twists and turns that occur. This series is not like series such as Ah My Goddess or Ranma 1/2. Fushigi Yuugi is written more as a novel than a series. Each episode follows from the lat as Miaka searches for her seven Seishi. This can be irritating since the cliff hangers are frequent and nausiating. Each episode leaves you begging for more and cursing the author as you eagerly await another half hour fix. I would advise anyone against watching this unless they want to be in for the long haul. For those of you interested. Fushigi Yuugi has recently been snatched up by PIONEER. (The Art of Entertainment) Consumers interested in more information can see their website or call the numbers available. The video's are being released in both Dub and Sub and are supposed to be available this fall which is I suppose now. I admit I've seen an order form for the second Video in Comic Previews so this series is available to be snatched up. Also "Animerica Extra" available THIS MONTH are releasing translated versions of Watase Yu's original Manga. For those of us that remain Japanese illeterate. The first 40 pages of the tale is available within the magazine and for you Americans its only $4.95. Included within are also Video Girl Ai, Steam Detective and X/1999. I have just personally finished reading FY and it is different to the Anime. A good read and Dave's recommendation for the week. Although Maison Ikkoku and Video Girl Ai were both very good as well so I dunno. Fushigi Yuugi Episode can be purchased at Tomodachi Anime There are a list of instructions on how to purchase the goods. If you would like to join the Suzaku no Web Ring, visit the home page for info.